Get your hands on this best-selling book on building your own banking system through cash value life insurance. Not only is it simple to read, for a limited time only you get access to a digital copy at a huge discount. "Never thought I would read, much less enjoy a book about finances and money, but this book broke the mold. 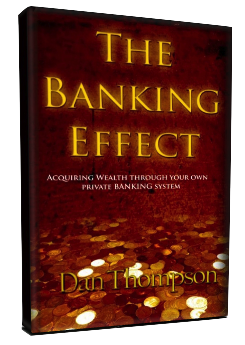 Dan Thompson’s, The Banking Effect, is a must read for anyone who wants to take charge of their financial security. Innovative and thought provoking… I wish I would have had this book 20 years ago!" Peggy D.
"The economic environment has changed. We may never experience the kinds of growth that we have seen in the past. Taxes are uncertain, the threat of inflation looms, risk of loss is a real concern, and so many of us are wondering how we are going to acquire enough wealth to retire. The Banking Effect gives you the powerful insights you need to completely understand Infinite Banking and take your wealth to the next level. Dan Thompson gives some brilliant information on many different points including: the velocity of money, saving for retirement, paying off your mortgage, gaining superior tax benefits, and realizing your financial goals."